On January 28 representatives from Global Finance’s World’s Best Companies gathered in New York’s Palace Hotel for an award ceremony.This year 35 awards were presented to recipients from 22 industry sectors, from airlines to wholesale. Winners were in attendance from Europe, Asia and South and North America. 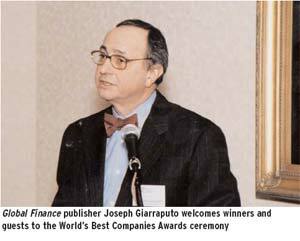 Global Finance’s publisher Joseph Giarraputo conducted the ceremony, and Christopher Giarraputo, Global Finance’s managing director, presented awards. 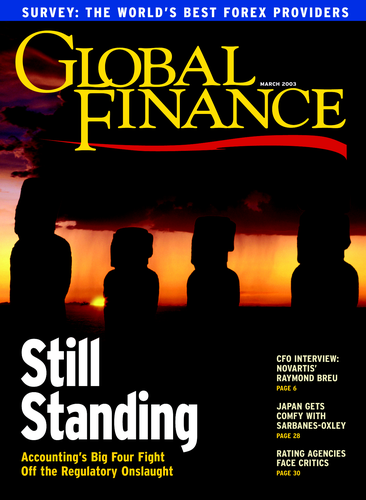 The winners of all of the World’s Best Companies Awards were first announced in the November issue of Global Finance. Previous World’s Best Companies awards ceremonies were held in New York,Washington and London.